Left to right: Lisa Bonin, Natalie Lesco, Preksha Lukkhoo, the Honourable J. Michal Fairburn of the Court of Appeal for Ontario, the Honourable Suzanne Côté of the Supreme Court of Canada, the Honourable Justice Ritu Khullar of the Court of Appeal of Alberta, Amy Langley, Andrew Wallace, and Kana Nakano. The Wilson Moot 2019 took place on Friday and Saturday, February 22 and 23, 2019 at the Federal Court facilities in downtown Toronto. Bond University is the overall winner of the Wilson Moot 2019. Team members included Amy Langley, Natalie Lesco, Preksha Lukkhoo, and Andrew Wallace, who competed successfully against 12 other participating law schools. The preliminary rounds took place in Toronto on February 22 and 23, 2019 and the final moot between the top two teams from Bond University and the University of Ottawa was held on Saturday afternoon. Queen’s University placed third in the competition. 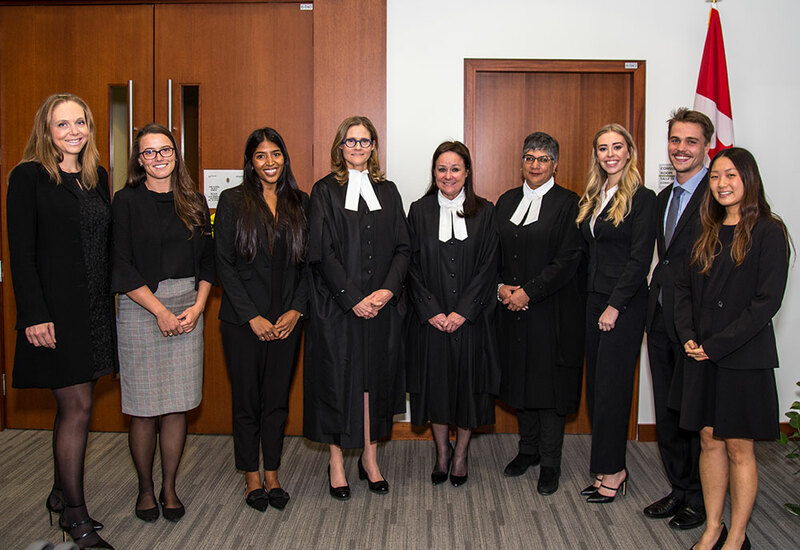 The bench for the final round included the Honourable Suzanne Côté of the Supreme Court of Canada, the Honourable J. Michal Fairburn of the Court of Appeal for Ontario and the Honourable Justice Ritu Khullar of the Court of Appeal of Alberta. The prizes for best written argument were awarded to the Bond University followed by Queen’s University and University of Alberta. The top oralist was Maia Stevenson of McGill University, Uttra Gautam of the University of Ottawa placed second, and Nico Bernardi from the University of Victoria placed third. Congratulations and thanks to all participants and volunteers that worked to make this year’s moot a success.